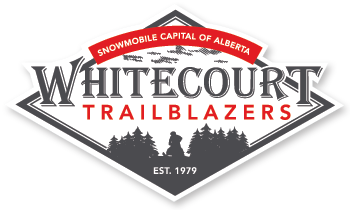 The Town bylaw allowing OHV riding from Whitecourt expires on March 31. All sleds must be trailered out to the trails. Trails are FANTASTIC! Great job by the groomer operators and volunteers. Lots of fresh snow out there. The Town trail from the Mcleod River to West Mountain Road is closed due to construction in the area for the water treatment plant. Access is still open along Beaver Creek. Lots of fresh snow lately. Groomer was out again today and will be grooming to Summit Shelter tomorrow. Trails are in very good condition. Caution! Large tree down on the North Trail System between #’s 8 & 9. Trailblazers are working to get this area clear. Trails are in great condition. Lots of snow out there. Enjoy! With almost a foot of fresh snow received in the past couple of days, a Triangle ride in one day would be hard to do. We will postpone it for now with the possibility of riding it next weekend. Stay tuned…….Enjoy the powder!